Got a leak? Broken water heater? As your plumbing professionals, we understand how unpleasant and inconvenient a plumbing problem can be. That’s why our standard operating hours include Saturdays 8:00 AM to 8:00 PM and Sundays 8:00 AM to 5:00 PM at no extra charge to our weekday rate, while our knowledgeable team of technicians are available for emergency plumbing service calls seven days of the week on our Emergency Hotline: 1-800-475-1504. Our response teams will be on hand in a matter of minutes to help you tackle sewer repairs, leak repairs, slab leak detection, emergency drain clearing, plumbing inspections, odor and gas leak locating, plumbing fixture installations, pipeline repair and replacement, flood protection system installation, and backflow preventer installation. Up-Front Flat Rate Pricing & No Surprises – Guaranteed! People are often deterred at the prospect of inflated pricing when requesting emergency plumbing services. 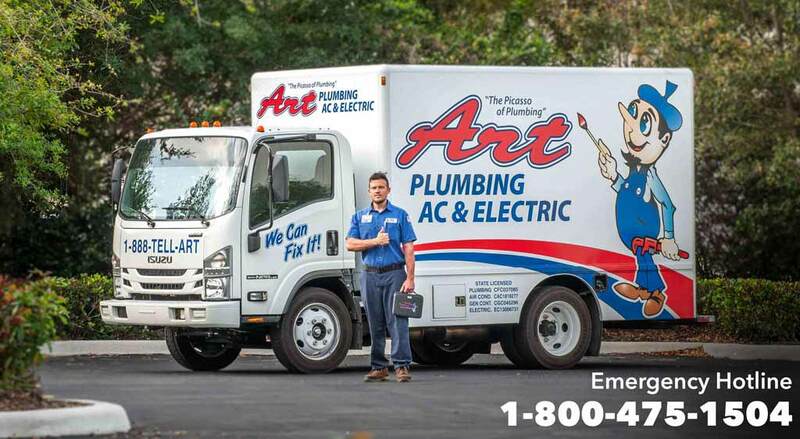 With a glowing reputation in Florida that goes back to 1983, Art Plumbing, AC & Electric prides itself on our value statement, our satisfaction guarantee, our extensive team of expert technicians, our high level of customer service, and our up-front flat rate pricing. Don’t delay! Call Art Plumbing, AC & Electric today.